Studio A and B are rented together for weddings, typically require a full day rental at $2300. Half day rentals are $1250 (either 10am to 4pm, or 4pm to 10pm) Additional hours are $250/hour. $1,000.00 required to hold the date for your wedding, and goes towards your invoice. Non-wedding events: Studio A is $160/hour, Studio B is $110/hr. Rental packages (tables, chairs, linens) are available and must go thru us. No outside rental vendors allowed. Self catering fee: $75; allowed to bring in your own catering upon venue manager approval. AV available! 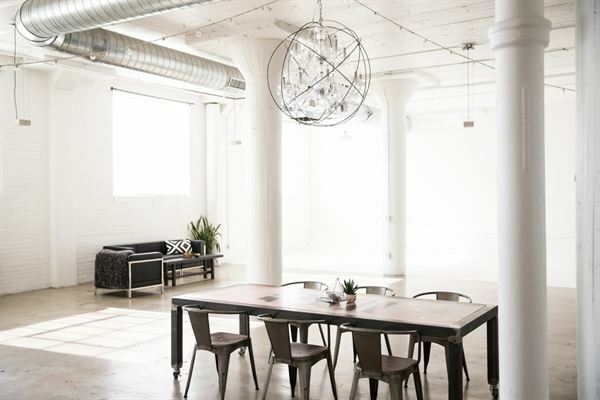 2300 square foot loft-style white space located on the third floor. Fits up to 250 for an open house type of event, 140 for a seated dinner. 1300 sq. ft white space perfect for small retreats, baby showers, birthday parties, etc. Also has a small side room for storage, or can use for food serving area. Park City Live is your preferred destination for corporate, social and private events in Utah. Our unique historic, Art Deco venue located in the heart of Park City is available year round to entertain you and your business. Our 10,000 square foot venue offers an exclusive space for anything you can imagine: a formal soiree, a corporate retreat, a rockin' fundraiser, the perfect spot to launch your brand. Park City Live is available for your traditional work retreats, but our strength is providing an opportunity to think outside the box. The advantage to hosting your party in Utah's premier music venue is the state of the art audio and visual capabilities. We also offer professional talent buying services that will enable once in a lifetime experiences for your event. From your local party rockin' DJ's to national acts like: Snoop Dogg, The Chainsmokers, The Avett Brothers, Foo Fighters, Wiz Khalifa, and many more... Park City Live's team of experts are here to create the perfect atmosphere that fits your budget and exceeds your expectations. Launching a new product? Hosting a vendor educational? Redefine the experience in a space that is as memorable as your brand. Imagine anything from skateboarding exhibitions to live aerial art. PCL will morph to accommodate your dreams. Come take a closer look at this facility and unlock your wildest potential. With access to the world’s greatest musical entertainment, full-service event production, state-of-the-art lighting and sound, custom menus and mixology, this unique 18,000 square-foot venue will exceed the expectations of even the most discerning guest. Located in the Historic Union Pacific Station, The Depot’s four distinctive event spaces feature exposed brick walls, crafted wood and beautiful stainless steel bars. Celebrate your brand in style as guests arrive greeted with your name in lights on the entrance marquee. Host an event in the multi-level Music Hall, the Grand Hall, versatile 400 room or in the intimate and stylish Blue Goose Room and make it an event to remember! Aspen Landing’s atmosphere is one of simple elegance. Our beautiful custom built reception venue includes a lush private garden area, grand staircase, baby grand piano, rustic fireplace, and separate bride’s and groom’s dressing rooms. The setting is perfect for an elaborate open house reception as well as intimate smaller celebrations. We are located in a central valley location near freeway access. Aspen Landing is the finest wedding reception venues. At Ogden Comfort Suites, we welcome our guests with warm hospitality, large suite accommodations, great value and a family-oriented atmosphere. We are equipped to handle small meetings, large meetings and all your corporate events. Our staff and recently renovated facilities can handle groups from 2 to 400. We know how important getting the meeting right is for you and your team. Our staff is dedicated to alleviating the stress over the venue. We can take care of everything…just let us know what you need. We offer great rates, professional staffing, special night rates and more as part of our Party Packages. We customize the experience to what you need. Let us know what you need and we’ll go to work to make it happen. Our Spacious, full service clubhouse is the perfect choice for your business meeting, wedding, reception, holiday party, luncheon or dinner party. Jeremy Ranch Golf and Country Club takes pride in adding the personal touch to make your event special. Our onsite Event Manager can organize any type of function, keeping your budget and style in mind. The clubhouse feature rooms to accommodate both small and large events. Inside, our scenic Canyon Room can seat up to 150 and outside, our brand new Club Courtyard is the perfect setting for a ceremony. Schedule a visit to see what Jeremy Ranch Golf and Country Club can offer for your next event! Let the professionals at Hilton Garden Inn Ogden help with all of the details when planning your special event. Guests will enjoy our flexible meeting spaces, spacious rooms and great amenities as they experience our superior service. Whether you're planning a wedding, business meeting or family reunion, you can count on our attentive staff to help make your event extra-special. Contact our event planning experts at Hilton Garden Inn Ogden for more information. We are West Valley's newest event venue! Enjoy our serene indoor garden setting, which creates the perfect backdrop for any kind of event. Weddings, family reunions, corporate events, memorials and family celebrations are beautiful events that will become treasured memories. Call today to schedule tour! Nestled in the heart of downtown Salt Lake City, Utah Infinity Event Center is a premier event venue space, offering multiple rooms to rent for your public and private events. We are within walking distance of shopping, restaurants, light rail and hotels. This event center provides amenities such as nearby parking lot, valet service, free wireless high-speed internet access in all rooms, non-smoking facility, etc. We can provide catering service through our preferred catering list, however we do allow outside catering as well. We provide lighting and audio visual services if needed. With one large ballroom, a bar, and lounge, Infinity Event Center can accommodate up to 1500 of your guests and is the ideal place to hold your next event. We will help you create an intimate private event, a large public concert, an elegant gala, a wedding or any other event.